Rarely, and for only short periods of time, can you experience a balanced helm during a 20+ knot downwind. Helm exists indefinitely; it’s just a matter of how much. As the wind increases so does the factor of helm influenced by the center of effort vs. the center of lateral resistance, heel angle, and boat speeds. If you can recall, having to hold the tiller extension by the universal, then you have no doubt experienced erratic helms where the boat rocks seemingly out of control. Using the rudder to stabilize the boat is a band-aid solution. Each time the boat wants to respond to helm, the un-read message is that the sheet tension is too tight or too loose for the current angle and speed. Making corrections based on feeling is confusing and is the main reason you may resort to using your rudder for security. Understanding the best solution for each helm at different moments can help you prepare for the constantly changing battle. 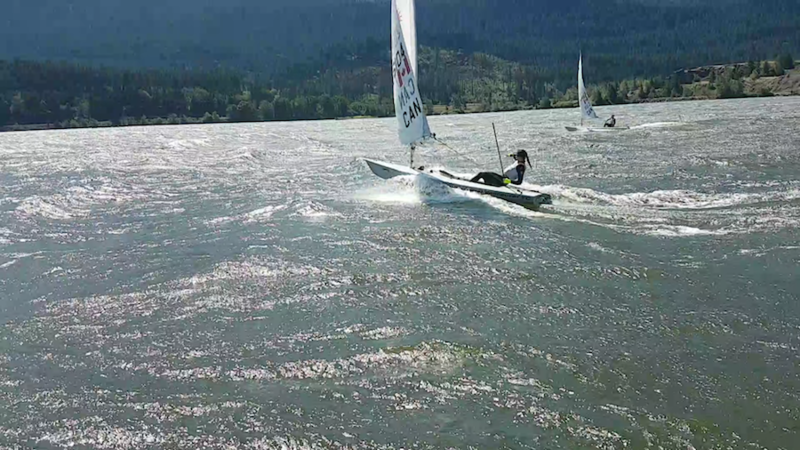 Being under-sheeted downwind causes lee helm. As the wind passes behind the sail the force is directed across the boat, heeling it to windward instead of pushing the boat forward. With lee helm, the boat feels like it wants to bear away constantly. Heading up with your rudder adds weather helm into the foils to combat the heel of the boat but it’s only enough to keep the boat in limbo. Any increase of speed exacerbates lee helm and can become too much to fight with the rudder and often end in a death roll. Having your sail sheeted in too far can feel the exact same way as being under-sheeted. If the sail is over-trimmed it can easily stall, especially when slowing down (climbing a wave). The apparent wind can shift so far back that the sail loses flow across the back of it, decreasing sail force dramatically. When that happens the boat heels to windward and gives the feeling that it wants to bear away. This one is dangerous because we want to react as if we’re under-trimmed—sit to leeward, sheet in and head up to get some weather helm. 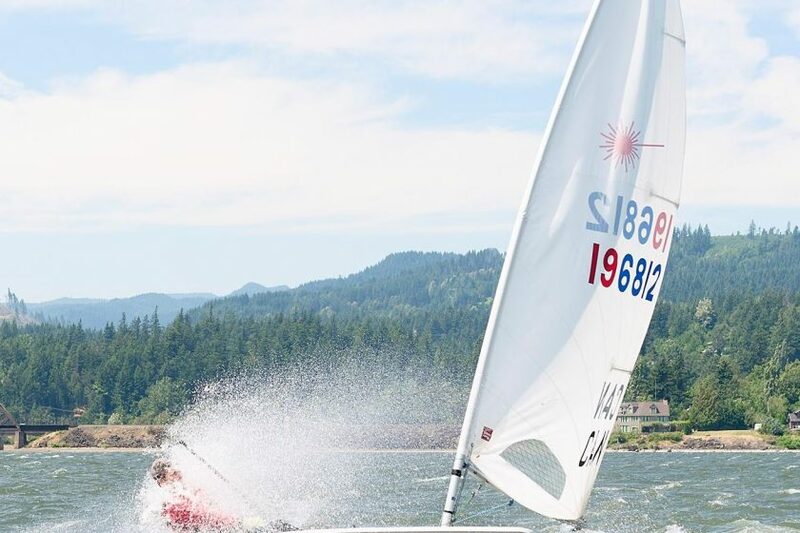 The moment air can travel across the back of the sail, it will be injected with a greater amount of force due to the slower speed of the boat, your recovery angle, and sheet tension. The insurmountable weather helm effect will be similar to attempting a gybe and having your boom hit the water. What’s the easiest way to recover from broaching? A hard rudder bear-away will stall the sail again, flattening the boat, giving you a momentary band-aid solution and reset the cycle of imbalance. 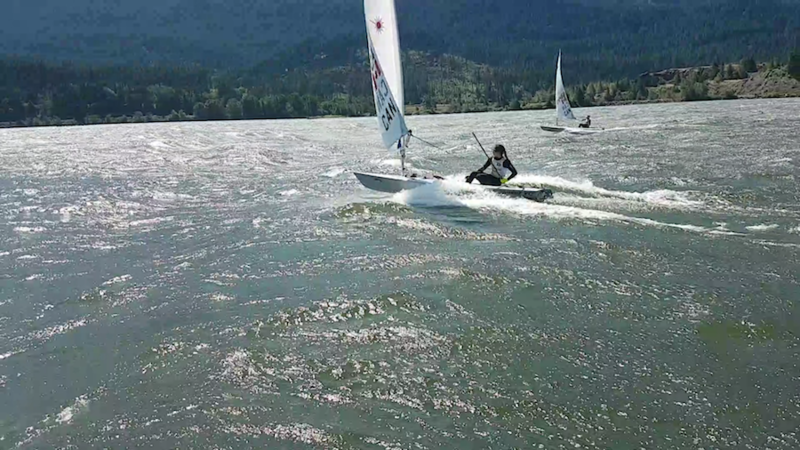 If you can determine if the sail is stalling and sheet out to match the new apparent wind angle you won’t have to change your body position or use your rudder. The sensation of lee helm is increased when the boat speed is faster. Swinging the apparent wind forward reduces the amount of lateral force. In essence, it’s easier to death roll when surfing a wave. Conversely, the weather helm can be increased if the sheet trim is accurate when climbing a wave. This is where you want to find your balance in big breeze. If you can always access some weather helm, but not too much with good sheet tension, then you can sit on the weather side and lean back, affording stability by balancing your weight against the heel of the boat. Before climbing the wave, the sheet trim is accurate and boat is balanced with little helm. After climbing the wave the sheet is eased about 3 feet to adjust for the apparent wind going aft. This keeps power in the sail, prevents stalling and allows for the skipper to keep their weight outboard. Keeping the foils aligned is critical to maintaining the hard earned balance from sheet tension and weight distribution. As an example—imagine sailing straight downwind, completely balanced, then push and pull the tiller back and forth across centerline. You should hear the daggerboard in the trunk thunking up against the walls each time you change direction. Pull the rudder to windward and the force direction change to windward on the daggerboard will be immediate. Push it back to leeward and the daggerboard will again load the leeward side. Every time this force direction changes we upset the air and foil balancing act. It would be cruel and unusual if you were sailing upwind while someone is taking your daggerboard completely out of the trunk then putting it back in the trunk every few seconds. The same thing happens downwind if you are sailing a loose broad reach then quickly bear away with the rudder. The opposite side of the daggerboard force will load and the boat will quickly heel to windward. This doesn’t necessarily mean that your sail configuration was incorrect, rather the amount of overall force stabilizing the boat has been reduced making it feel unbalanced. Using your rudder is a quick fix but you have to pay attention to what the boat is asking for. Erratic rudder movements lead to more erratic rudder movements and in big breeze all we want to do is avoid the big helms that happen by mistake. Stay safe, keep sheeting.